Enjoying my last days of the spring break, which means I still have lots of time to spend on a healthy, delicious and last-minute lunch! 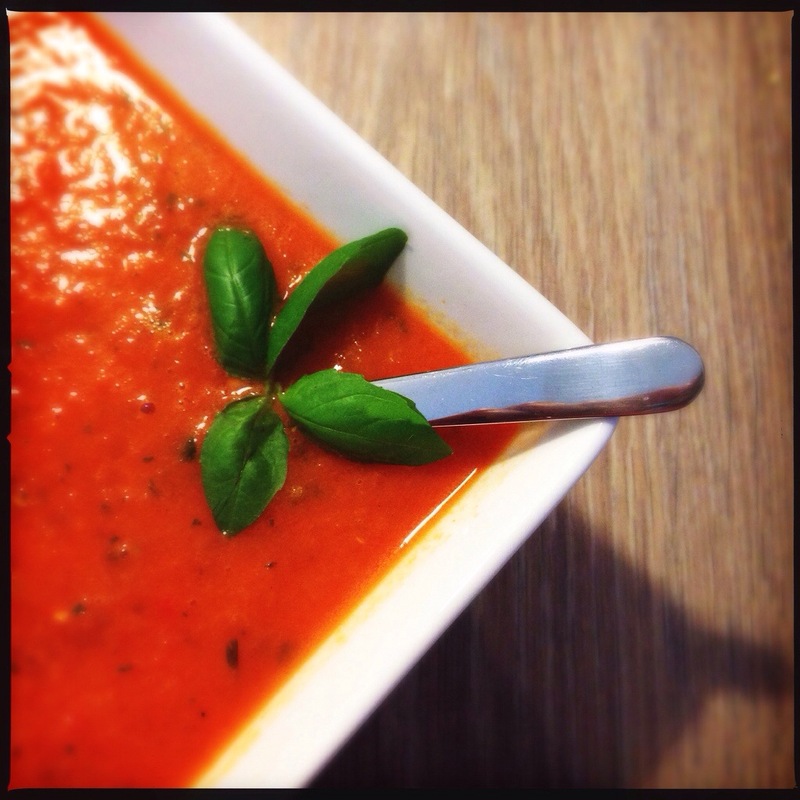 Today a pretty red soup made of roasted veggies: roasted bell pepper, roasted onion and roasted garlic and tomatoes. In this case I roasted the onion and the garlic, together with the bell peppers in the oven. Onion and garlic can have a bloating and gas-generating effect, but they are much easier to digest when you heat then. The roasted onion gives a soft, sweet taste to this soup as well. Preheat the oven to 180 degrees celcius. Carve the bell peppers a little at the top and roast them together with the garlic and onion (both garlic and onion with skin on) for about 45 minutes in the oven. The bell peppers will turn a little black on top! Put the peppers in a plastic bag after roasting, close the bag and set aside for 10 minutes. Carve the top of the tomatoes and soak them in hot water for 10 minutes. After 10 minutes you can easily remove the skin. 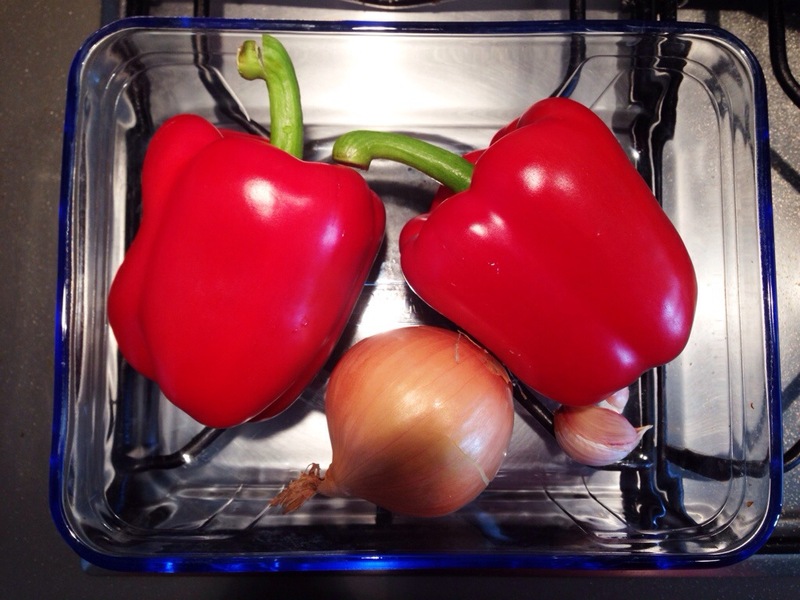 Also remove the skin and seeds from the bell peppers, onion and garlic. Put all the ingredients in a blender together with the 200 ml of hot water, vegetable stock, olive oil and basil leaves. Blend into a smooth soup. Heat it up in a pan a little more if necessary. Poor the soup into a bowl and add salt & pepper to taste! Posted in Lunch, recipes, Soup, VeganTagged dairyfree, fit, food, glutenfree, glutenvrij, healthy, healthy lunch, herbs, lunch, recipe, soep, soup, soyfree, sugarfree, suikervrij, vegan, vegetables, vegetarian, veggie, veggies, zuivelvrijBookmark the permalink.